Make Way for Martian is one of Jimmy T.'s microgames in WarioWare: Twisted! It returns in WarioWare Gold as one of Ashley and Red's microgames. The name is a pun on the phrase "Make way for man." The game's purpose is to make a martian land on Earth. 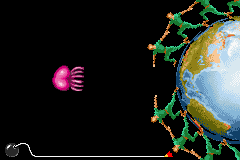 To do so, the player must move the humans in the two first levels to make him land on an empty space, and the martian in the last level to protect the earth from the falling meteor. 1st level difficulty: The martian descends horizontally, so its landing location is small. 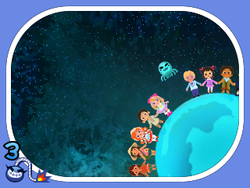 2nd level difficulty: The martian descends vertically, so its landing location is wide. 3rd level difficulty: The martian is on Earth, the player has to move him to hit the falling meteor. This is done from the same perspective as Level 1. This page was last edited on January 19, 2019, at 03:17.